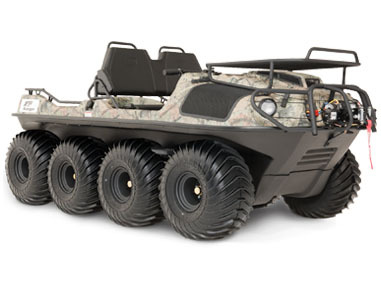 As part of Argo’s Wilderness series, this vehicle is equipped with everything you need for hunting and fishing including a brushguard, front cargo rack, gun rack and a body painted in Mossy Oak’s Break-Up Country or Shadow Grass Blades camouflage. A 30 HP Kohler Aegis V-twin, an Admiral transmission and either standard or high torque gearing, give the Huntmaster the power to tackle anything from mud bogs to mountains while carrying up to 935 lbs., towing up to 1,800 lbs. and carrying up to 6 passengers. This model is equipped with aluminum beadlock rims and a front-mounted 3,500 lb. Warn winch.